A tour to get ready for the nightlife of Kreuzberg and Neukölln, here where people gather to leave the day behind and to start their nightly adventures. Slowly glide through the night and let your eyes wander whilst listening to insider stories. 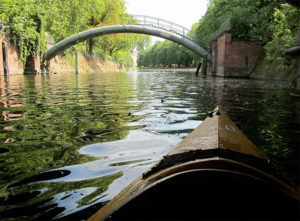 Paddling along the border triangle of three unlike districts – one of them former part of the GDR. As darkness rises our kayak lights promise a unique experience …take your chance and be part of our night tour! For groups of more than 4 please send us an e-mail. Private tours on request from april to october. Meeting point is our Kayak Truck opposit a-horn cafe at Carl-Herz-Ufer 9. We start paddleing on the right side of the van Loon Restaurant ship where you can have a nice breakfast or lunch. Public transport: subway U1 – station “Prinzenstraße” / Address for the GPS: Carl-Herz-Ufer 9. The tour ends at the same spot.